Info: Send something just for your favorite chocolate lover. This basket has just enough chocolate to satisfy anyone's sweet tooth, but not so much that they'll feel guilty for not sharing. 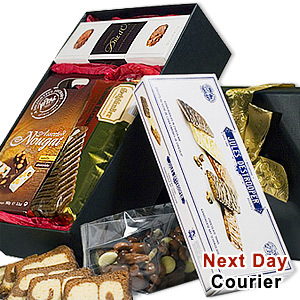 Marble Cake, Destrooper chocolate thins, Duc D'O Belgian flaked truffles, assorted chocolat nougat mix, chocolate coated nut and fruit mix are presented in a luxury box. A true chocolate lover's delight!